President Donald Trump has yet to name his replacement for retiring Supreme Court Justice Anthony Kennedy, but the push to approve his new pick has already begun. Add Supreme Court as an interest to stay up to date on the latest Supreme Court news, video, and analysis from ABC News. White House press secretary Sarah Sanders tweeted that five senators expected to play a crucial role in swinging the confirmation process were invited to the White House on Thursday evening. Sanders called the meeting part of the president's "ongoing outreach" to get advice from both Democrats and Republicans on filling the opening on the court. Those invited were: Sens. Lisa Murkowski, R-Alaska; Susan Collins, R-Maine; Joe Manchin, D-W.V. ; Joe Donnelly, D-Ind., and Heidi Heitkamp, D-N.D. The president also spoke to "more than a dozen" other senators by phone on Thursday, Sanders said. Tonight @POTUS met w/ Senators Grassley, Collins, Murkowski, Manchin, Donnelly, and Heitkamp to discuss the Supreme Court vacancy. @POTUS team also talked w/ more than a dozen other Senators today as part of ongoing outreach to get views and advice from both sides of the aisle. Kennedy, often a crucial swing vote himself on the Supreme Court, announced he would be retiring from the highest court in the nation on Wednesday. The 81-year-old was named to the court in 1988 by then-President Ronald Reagan. Kennedy was confirmed by the Senate by a vote of 97-0. Whomever Trump picks is unlikely to be so overwhelmingly approved. While the president has not publicly narrowed down a choice, he said the new justice nominee will come from a list of 25 options he released in November 2017. Marquee names on that list include Utah Sen. Mike Lee, U.S. Circuit Judge Amul Thapar of Kentucky and U.S. Circuit Judge Brett Kavanaugh of Maryland. 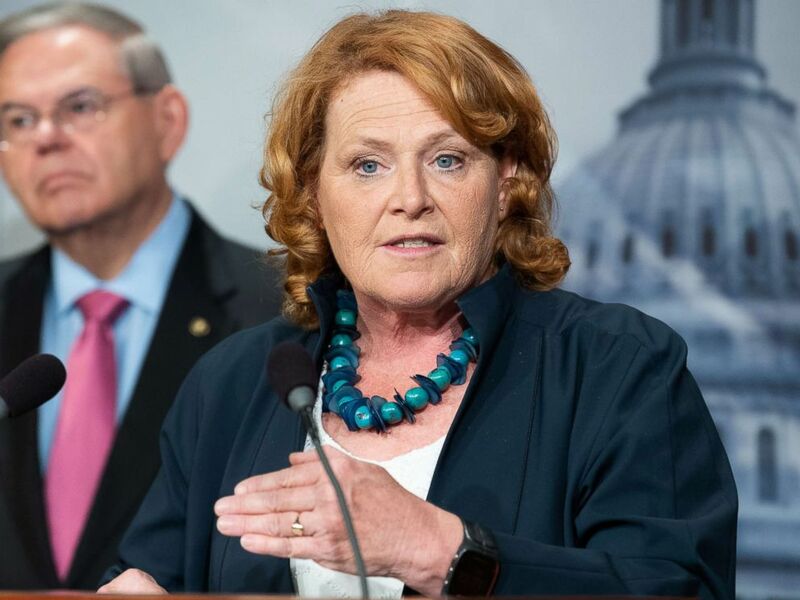 The meeting with Heitkamp came less than 24 hours after he slammed the North Dakota senator in a rally at Fargo for her opponent in the midterm elections, Rep. Kevin Cramer. Despite a reputation for being a moderate, he labeled her a "liberal Democrat" and said she "went to Washington and immediately joined Chuck [Schumer] and Nancy [Pelosi}." Sen. Heidi Heitkamp speaks at a press conference about the proposed Central American Reform And Enforcement Act in the US Capitol. "You need a senator who doesn't just talk like they're from North Dakota, but votes like they're from North Dakota," Trump said Wednesday. "That's what you need and that is Kevin Cramer." She addressed the president's comments in a statement following the meeting with Trump. "Political speeches are just that, but the next day, I'm ready to get to work," Heitkamp said. "As I said, if the president wants to meet with me, I'm ready to participate and advocate for North Dakota. And that's exactly what happened today." Manchin thanked the president for the meeting and called it a "productive conversation." I appreciate @realDonaldTrump inviting me to the White House tonight. We had a productive conversation about how we can work together to move #WV and our county forward. I look forward to more positive meetings. Manchin, Heitkamp and Donnelly were the only three Democrats to vote to confirm Trump's previous Supreme Court nominee, Neil Gorsuch. Senate Majority Leader Mitch McConnell said Wednesday he would move quickly to get the Senate to confirm Trump's pick. "When the president presents the Senate with his choice for the Supreme Court, I will thoroughly review the record and qualifications of that nominee," Donnelly said in a statement following the meeting. ABC News' Mariam Khan contributed to this report.